Home Magazine Only.com? Not quite. A confusing logo led me to the wrong domain name. 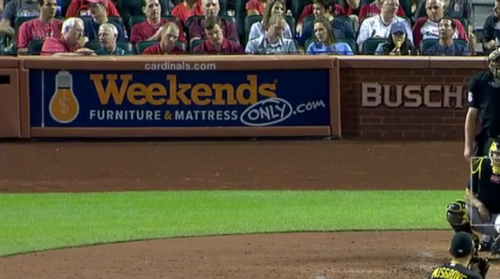 I was watching a Cardinals baseball game recently and saw an interesting advertisement behind home plate (see image above). What’s the domain name being promoted here? Having never heard of this company, I wondered if its domain name was Only.com. It seemed odd for a company named Weekends to use this domain. But Only.com seemed to be highlighted in the ad. After seeing the logo, I can understand the placement of the .com in the ad. I’m sure people in St. Louis who are familiar with this store would understand that the domain name is WeekendsOnly.com, but it wasn’t clear to me and I’m sure other people who aren’t familiar with the brand would agree. I probably should take issue with the logo rather than how the company promoted its website.